This blog, ten books in to S. M. Stirling’s Emberverse series, and seven books into the tale of High King Artos and his war against the Church Universal and Triumphant — or, more particularly, the eldritch forces that drive them, discusses the two most recent books set in Stirling’s post-Change world. Spoilers exist. As previously discussed, the accumulated wear & tear of series fiction weighs down this novel. Reminders eerily like the reminders one read in the previous novel which are fundamentally the same reminders one read in the one before that (and so on, and so forth) allow that rare creature, the reader new to the series, to make his or her way through the text without too much confusion. A slow, laborious way, for now the reminders consist of genuinely Old News. One nearly believes they pad the novel for length rather than provide necessary backstory. In any event, the United States of Boise is returned to fully human rule through stealth; it seems Fred Thurston knows of a secret way into the walled city. Between the efforts of skullduggery, the Sword of the Lady, and some Boise troops under a false flag, the mighty bastion is taken without an expensive and lengthy seige. Stirling amuses his readers by describing in greater detail the people of Yellowstone; when the Change knocked all aircraft out of the sky a 747 carrying girl and boy scouts landed in the wilderness. The scurvy but skilled hired tracker who lost at the game of swords with Ritva Havel is one of this band, who accrue badges and spout Scoutisms. High King Artos makes them an ally, and brings the fight to the CUT proper. Slave farms, breeding programs, children thrown into battle — the CUT are bad guys, and no mistake. But the once reviled, now esteemed Major Graber, leading a guerilla effort against his former masters, joins the fight, and he will play a role in post CUT Montana & Wyoming. The Hero of this tale gets his victory, however, and years pass. The Dunedain and Mckenzies colonize northern California (now “Westria”), with the Dunedain in particular taking their love of flets to the redwoods with vigor. The High King and Queen’s children grow up. The eldest, Orlaith, is clearly the heir to the Kingdom of Montival, while her brother John looks to be in line to inherit the throne from his mother, Mathilda. High King Artos, once told by no less a luminary than Odin himself that he would not live to see his hair go gray, but that he would die with his blade in his hand, does just this. For readers of the series this death is unsurprising. As Caine of Matthew Woodring Stover’s Heroes Die tells us, heroes die. Stirling puts this death off, and off, and off, until by book ten of the series it hardly matters. But it does matter; Stirling manages to make the passing of Rudi Mckenzie a moving moment; he dies a hero’s death, and more woe follows in the next novel. By structuring the series in this way, Stirling plays the moves the only way possible. An ally in need is introduced; an old enemy resurfaces, and the hook is set for Artos’s daughter, Orlaith, to take on the primary role. After the chapterization of the most recent three novels (at least), fans of the series no doubt cross their fingers, hoping for a reboot as significant as that which enlivened the Emberverse series with The Sunrise Lands. That text left behind the War of the Eye (AKA The Protector’s War) with the vision-troubled arrival of Ingolf Vogeler, soon to be called Ingolf the Wanderer in recognition of his nearly impossible coast-to-coast journeying in post-change north America. Ingolf brings word of the Sword of the Lady. In the next chapter of the Emberverse, and as of today the most recent, as a fall 2014 release, The Golden Princess finishes introducing the much-pursued Japanese cadre, who reveal their secrets over the course of this book. The Emperor of Japan (a grand term for a polity roughly 1/15th the size of Montival that has yet to reclaim the main islands) perished on a California beach within minutes of Artos himself. His daughter becomes Empress, and carries on their vision-induced quest: to recover the Grass-cutting Sword, one of the artifacts of their people. The Golden Princess, Orlaith, also suffers visions, as does her brother, John. The Golden Princess becomes a “let’s organize the quest” novel. Alas, Stirling managed this trick in roughly 1/3 of The Sunrise Lands. Alas, what remains are frequent reminders of backstory. Alas, despite some minor skirmishes and a reminder that the bad guys with the pitch-black eyes (isn’t that a TV-Tropes recognized meme for possession? Yes, it is — “Black Eyes of Evil”) still play the game, The Golden Princess leaves much to be desired. Rather than a break with the past, it connects directly to the narrative of The Given Sacrifice. The reader gets to spend the experience of reading this novel watching Orlaith and her Japanese counterpart, Empress Reiko, get to know each other, and plan in secret their quest to retrieve the Grass-cutting sword, because of course there must be drama. Surely Queen Mathilda, having run off to join Rudi on his quest, would disapprove — no, wait, one might guess she’d be on board with a vision-induced quest, seeing as she herself participated in just such a thing. Even Empress Reiko brought along, on her vision-induced quest, some politico or the other who she fears has the power to make of her a figurehead, should she be so foolish as to… continue the mission that led to her father’s death after a journey across the Pacific Ocean? Too much here reeks of drama for the sake of drama. One imagines legions of fans urge Stirling to “get on with it!” This raises an interesting if entirely readerly question: Which is better? A thin, unsatisfying chapter every year, or a George R. R. Martin-sized delay between more ample chunks of story? No matter what the answer, fans hooked on the series can’t help but continue reading these increasingly frail installments, less novels and more chapters, as Stirling keeps spinning out the fascinating alternate future of life after the Change. 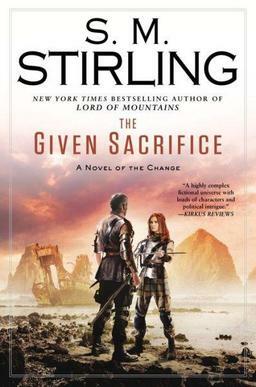 But the singular failure here remains Stirling’s missed chance to reset the series, to make it more possible for new readers to join in (and then read backwards as interest takes them) and go forward with a fresh set of characters in a fresh set of circumstances that do not require endless repetition of basic backstory elements. The symptoms of series fatigue are not unique; Weber, Cherryh, fill-in-the-blank’s long series suffer from them also. But the promise implied by Stirling’s intelligently written and plotted The Sunrise Lands fades away by this 11th book in the Emberverse. And that’s a true pity. Yet those of us with the Emberverse bug will, albeit with a slight grimace of anticipation, much like the face one makes when taking a spoonful of bitter medicine, read on. That’s the beauty of the Emberverse, the power of Stirling’s signal creation to date, his cunning hook pulling on our readerness. Next time, the final entry on the Emberverse — until fall of 2015, when one looks forward — with that slight grimace of anticipation — to The Desert and the Blade. Lots still to say about the series!